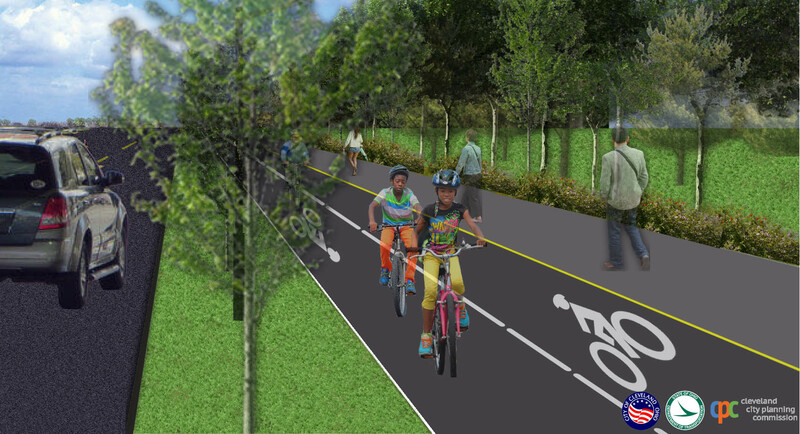 Today, the City of Cleveland submitted plans to the Ohio Department of Transportation for the creation of a protected, separated bicycle track to be incorporated in the Opportunity Corridor project. This bicycle track will connect residents to the city and region and achieve a goal of creating a protected, safe, and dedicated bike facility along Opportunity Corridor that welcomes both experienced and inexperienced riders while providing a safe separation for pedestrians. This decision comes after careful review of a proposal from Bike Cleveland and analysis from various City Departments including Traffic Engineering, City Planning, Public Works, Sustainability, and the State of Ohio Department of Transportation. The city’s plan ensures safe alternate means of travel by separating cyclists and pedestrians from anticipated heavy vehicle traffic with an eight foot, landscaped tree lawn. The advantages of a protected, separated bicycle track include separate paths for pedestrian and bicycle traffic, a tree lawn with additional greenspace and urban forestry, simpler installation of street signage, and no projected cost increases. The project bicycle track is expected to be included in the construction of the Opportunity Corridor Project. Opportunity Corridor is a transportation system improvement project between I-490/I-77 and University Circle in Cleveland. Construction commenced on March 16, 2015 and is expected to be completed in 2019. The total cost of the project is $331 million dollars.